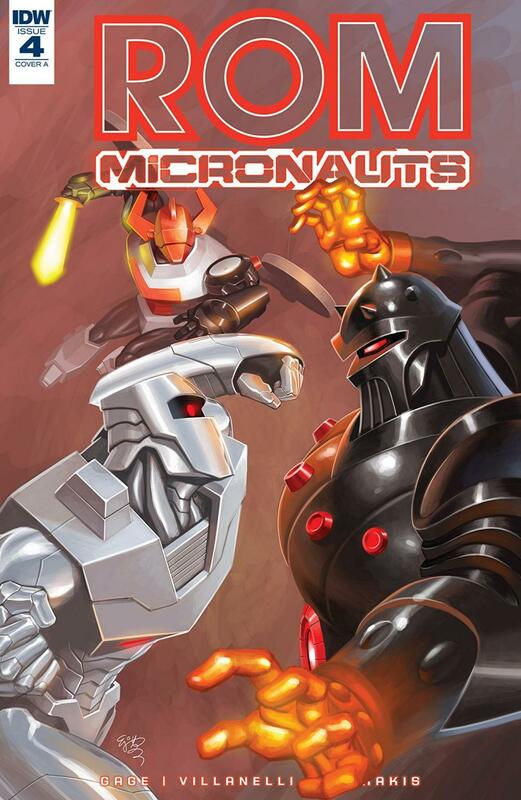 After a foray in the Microverse, Rom and the Micronauts make their way back to the real world just in time to confront the evil forces of the Wraiths as they kombat Rom’s Spaceknight and human allies. This penultimate confrontation leads our heroes towards their final fight with Baron Karza and the leaders of the Wraights. Most of this issue is dedicated to the fighting between the good guys and bad guys and I enjoyed it for the most part. Gage still uses quite a bit of exposition to propel the story forward - a lot of Rom monologuing - but that suits me fine as we are going into the final issue of the mini-series. One interesting part of the issue was the B-story that involved Acroyear (of the Micronauts) and Rom and how they come to grips with their robot/human hybridization and what it means when it comes to loving others. You’d think that this would be out of place in this story, but it had been hinted at in past issues so it was fine. At this point in the story, I’m interested to see where Gage goes from here and how he will resolve everything. It should, like the rest of the series, be fun.